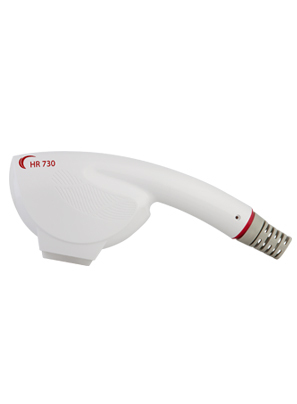 The HR 730 handpiece is designated for hair removal. Its dark red wavelength ranges from 730– 950nm and it has a spot size of 6.4 cm2. The handpiece is designed for skin types III-V, and its fluency ranges from 5-20 25 J/ cm2. The handpiece emits three types of DPC pulses- smooth, long or high. Once you enter the hair type and color, as well as the skin type, the handpiece’s software automatically sets the ideal treatment parameters. However, you can also select the manual mode. The handpiece is equipped with a Sapphire contact cooling with two modes- high and low – which protect the epidermis. The handpiece has been ergonomically designed for ease of use and quick access to all body areas.